Participate in a deadly tournament across a series of scenarios that call back to classic Dungeon Management gameplay! Levels are designed to be highly-replayable, and will test you against challenging AI and a variety of game modes. 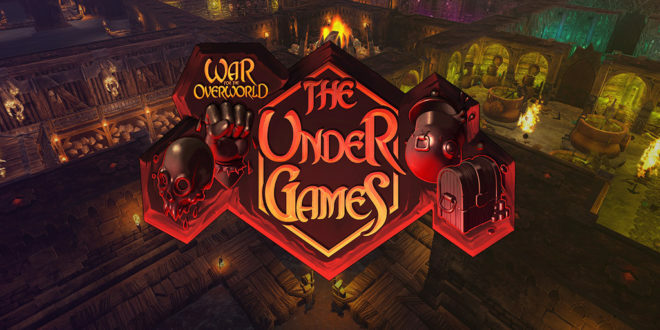 Choose from three new and unique Underlords: The bestial and explosive Shale, the stoic and steam-powered Volta, and the rotting reaper Lamash. Also play as gold-digger Kasita if you own Heart of Gold! Each Underlord has a unique personality and playstyle, driven by powerful traits and exclusive minions and Aspects. Race to capture and hold key positions in King of the Underhill, which will then blast your opponent’s Dungeon Core from distance. Or mount a multipronged attack against your opponent’s Core Shards, and watch as their dungeon crumbles. Customise your challenge to make The Under Games a cakewalk, a fire walk, or somewhere inbetween. With five difficulty levels and a multitude of AI personalities to battle, no playthrough will ever be the same. Will the AI push you to the brink? Experience the campaign as never before with new cutscenes, terrain themes, rebalanced levels, and improved tutorials. Build maps for nearly any mode, including My Pet Dungeon, then package them together into custom campaigns. Use the new Script Editor to trigger complex events, and share it all on the Steam Workshop. Rebuilt from the foundations to challenge even the most scheming players, our new AI can use all the tools and tricks you’ve come to rely on. Can you rise to the challenge? New terrain themes arrive in the enhanced Map Editor, which recast levels in either blood red or ice white. Calling back to the origins of the Dungeon Management genre, you can now drop different combinations of minions onto your altar; if the dark god is feeling generous, you might get something exciting in return. You’ll find countless new animations, gameplay improvements, balance adjustments, significant performance optimisations, and other changes and fixes – as you’ve come to expect from us in our quest to create the ultimate Dungeon Management experience. to classic Dungeon Management gameplay!